We collaborated with CHIKUHODO’s master brushmakers to bring you this limited edition collection: six exquisite brushes, designed by us and handcrafted in Japan. Each brush features cashmere-soft hair, bundled into a lacquered handle with an cherry blossom maki-e design that won’t flake or rub off. Powder Brush: Silky Saikoho goat hair makes this brush perfect for applying loose powders to any skin type. The softly rounded edge sweeps over your face’s curves without disturbing product underneath. Cheek Brush: This brush is designed to bring out the best in your blush, bronzer, and highlighter. The luxurious Saikoho goat bristles deposit the right amount of powder or cream products every time. Foundation Brush: Dome-shaped Saikoho goat bristles buff any liquid or cream foundation to a flawless, streak-free finish. This brush also works magic with cream contour products. Blending Brush: Made with Sokoho goat hair, this brush’s tapered silhouette fits perfectly into the crease of any eye shape. The flat edge lays down pigment while blending product with a soft, feather-light touch. Lip Brush: With the most precise shape in the collection, this synthetic brush delivers both full coverage and crisp, detailed lines. It’s also excellent for applying concealer. Brow Brush: Made of supple water badger hair, this flat, slant-tipped brush blends powder or pomade brow products to a natural finish. Travel Case: Lined with sleek satin, this brush case features 12 brush pockets and a zippered pouch to protect your tools wherever you go. Clean your brushes occasionally with a mild cleanser designed for natural hair, such as Clean Apothecary Brush Shampoo. Avoid getting water in the ferrules of the brushes, as this may damage them over time. Blown away by this set! When I first heard that Beautylish was announcing another Chikuhodo collab, I got so excited. I still use and love every single one of the brushes from the 2015 Sakura collection - they have held up beautifully just the same as any other Chikuhodo Z series brush I have & the sakura blossom details on the handles are just breathtaking. Initially, I was a little disappointed to hear this year's collection was using goat hair instead of squirrel hair (my usual preference). However - I received my brushes, and they are SO SOFT. I can honestly say they are the softest, highest quality goat brushes I have ever felt in my life. They really don't feel much different than my high quality squirrel brushes. 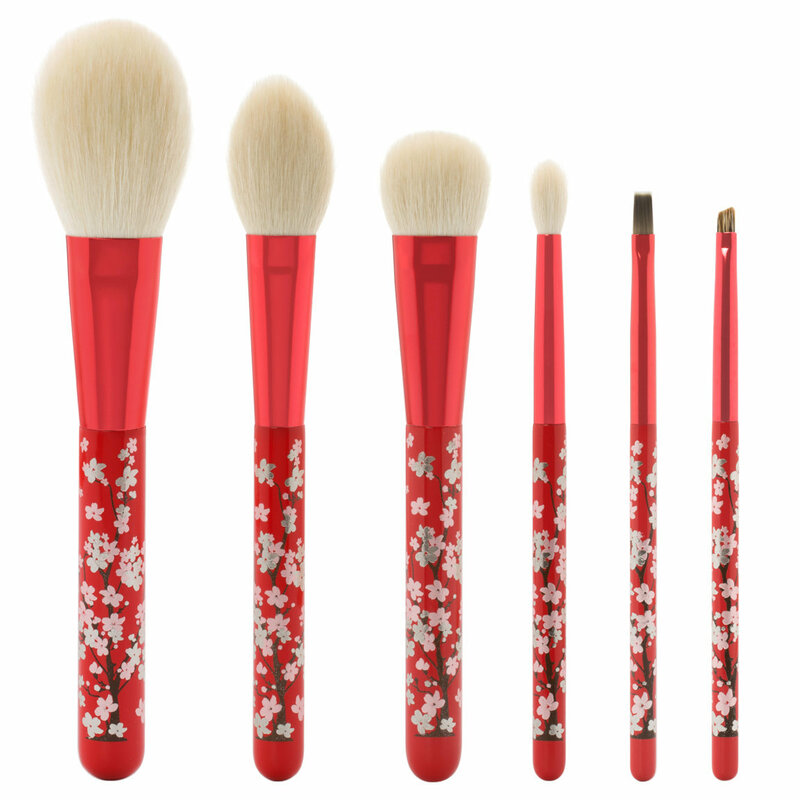 I also think the shapes of the brushes are so complimentary to last year's sakura collection. None of the brushes are identical to last year's & the two collections seem to blend so seamlessly. I love the 2016 Cheek brush for highlighter - the oblong shape and density is just perfect for buffing out highlighter on the tops of the cheekbones. The 2016 foundation brush is lovely for cream blush (I don't wear foundation, but I imagine it would be a great brush for that). The powder brush is so soft and deposits just the right amount of powder all over. I also love the eyebrow brush - I don't find it too thick at all to create a very natural brow shaping (though I do have naturally thick brows & just need a little filling in). The other two brushes are super functional - I love synthetic lip brushes for their ease of cleaning, and the crease brush reminds me a lot of a Mac 217 (and who doesn't have a million uses for that kind of brush?). All in all, I'm so glad I decided to get these brushes. They are GORGEOUS, super high quality, and have completely changed my mind about how nice goat hair brushes can be. In love! Thank you for another great collab, Beautylish. Can't say no to a pink Sakura paint! Although I could give a lot of alternatives to every single brush in this collection, most of them are more pricey than this set. Besides, the quality of this collection is almost the same as Tom Ford or other lines made by goat hair from Chikuhodo. PS, the brush case is soooo much better than the one in 2015. I wouldn't expect any less of these expertly-crafted Japanese brushes. The bright red design is beautiful and eye-catching and definitely unique. I'll take red lacquer over black or white any day. The travel bag is a great addition with the extra pocket for storage and the careful attention to detail in every aspect of packaging, design, and craftsmanship is just outstanding. These brushes are so soft they feel like they melt into the skin. I was so disappointed I missed out on last year's LE beautylish x chikuhodo set, but this year's seems to be a step up from all the reviews I've read. I'm really enjoying the blush, highlight, and eyebrow brushes so far. I can't wait to see the possibilities for these brushes in future usage. So I bought the Beautylish x CHIKUHODO set last year, while I was won over by the quality of the brushes, I was super disappointed with the make pouch. This collection, is beautiful beyond my dreams. First it is red, my favorite color. Second, the pouch is a major upgrade from last year. when I first see it, it reminds me of the elegant Kimonos that the Jap wear during occasions. It looked matt black on the outside, but opulent gold and black trimmings on the inside! It also has a separate section for makeup! So wonderful! All my comments made last year seemed to take into consideration this time. Third, the quality of the Saikoho goat hair, is so fluffy! Can't wait to stroke them!!! It's almost perfect, but of course there is always room for improvement. I love the brushes, don't get me wrong. But if the set contains a flat shader brush instead of the lip brush, it will be perfect! 2015 was almost perfect, but it lack a foundation brush and crappy pouch. 2016 was near perfect but it didn't have a firmer flat shader. Looking forward to 2017 collection already. This is the number one brush set I've ever owned. I'm obssessed! The pink Sakura paint is Beautiful! They are not only makeup brushes. They are pieces of Art! These brushes are so soft and so useful. Every single ones can be used in everyday bases. But I will save them for special days. I have had this set since it came out. I think it's been about two years. First, I use every brush in the set. There aren't any "throw always" Second, not one loose hair has ever fallen out. 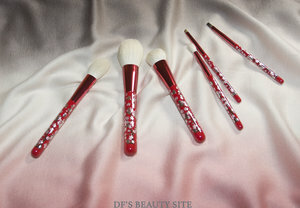 Each brush looks and feels brand new still after hundreds of uses and cleaning.. Plus, its a super cute set. I always get compliments on how they feel and the cherry blossom design. I highly recommend this set. Initially I was somewhat disappointed by the quality. I think perhaps because it's a limited edition product so they somewhat skimped on the workmanship. I felt like the ferrel was too light and felt a little cheap to hold. For the price, they could've given the handles for weight and balance. It felt like the same type of wood pencils are made of, light and hallow. I was also disappointed because I felt like the hairs weren't dense enough. The brushes bent, and gave way a little too easily which is an indication of lesser density. The design however is beautiful so for that reason I didn't want to part with it. I was relieved to find that once I used them, they did perform well. The hairs are super soft, and application was flawless. The only ones I don't reach for everyday was the lip brush and the foundation brush. So I do love these brushes, I just think the quality could be better.